On September 01, 1896, the day after Janmashtami (the auspicious appearance day of Lord Sri Krishna) in a little house in the Tollygunge suburb of Calcutta, a male child was born. His father, Gour Mohan De, and his mother Rajani, named him Abhay Charan (one who is fearless – having taken shelter at the lotus feet of Lord Krishna). An astrologer prepared the horoscope for the baby and revealed: When this child reaches the age of seventy, he will cross the ocean, become a great teacher of religion and establish 108 Krishna temples. And this is exactly what happened. Srila Prabhupada set out to America in 1965 and established the International Society for Krishna Consciousness at the age of sixty-nine. He travelled around the world fourteen times, established more than 100 temples of Krishna and initiated more than 10000 disciples into Krishna consciousness. 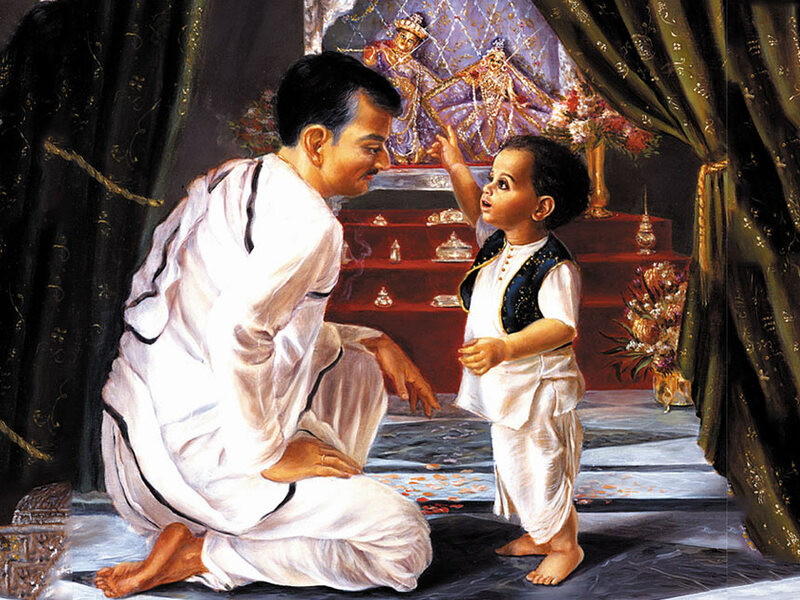 Srila Prabhupada always spoke of his early childhood with great fondness. Here we give excerpts from some of his books, lectures and conversations where he recalls his childhood. My father was a pure devotee of the Lord, and when I was only four or five years old, he gave me a couple of forms of Radha and Krishna. In a playful manner, I used to worship these Deities along with my sister, and I used to imitate the performances of a neighboring temple of Radha-Govinda. By constantly visiting this neighboring temple and copying the ceremonies in connection with my own Deities of play, I developed a natural affinity for the Lord. 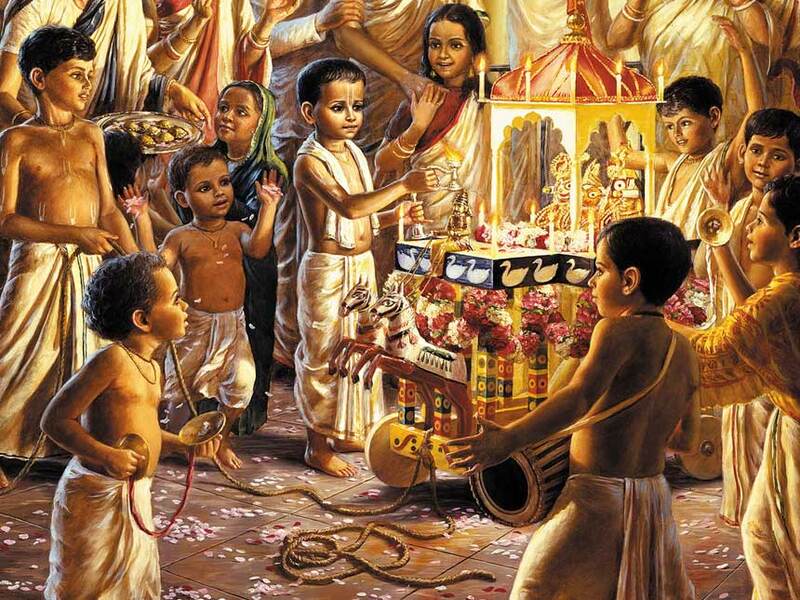 I remember when I was only about one year old, there was a great sankirtana in our house and I also joined the dancing party. And I was seeing up to their knees, very small. So I remember those days. In Calcutta there was a very virulent type of plague epidemic in 1898. So Calcutta became devastated. All people practically left Calcutta. Daily hundreds and hundreds of people were dying. I was one year old or one and a half years old. So one babaji, he organized sankirtana, Hare Krishna sankirtana all over Calcutta. And in the sankirtana, all people, Hindu, Muslim, Christian, Parsi, everyone joined. And they were going road to road, street to street, entering in every house. So the plague subsided. This is a fact. Everyone who knows history of Calcutta, know that the plague was subsided by sankirtana movement. My father’s income was, utmost, three hundred rupees. So we were not very rich men. But we had no want. Father was maintaining his family, getting children married, distributing the wealth. Everything very nice. And we never felt any want. In this mango season, because father saw to it that “There must be a full basket of mangoes daily for the children,” so we were jumping, playing and eating mangoes. When I was six years old my father gave me a ratha and encouraged to observe functions such as the Ratha-yatra and Dola-yatra ceremonies. I was performing the Ratha-yatra in my neighborhood. He used to spend money liberally for distributing prasada to us children and our friends. I received this training from the very beginning. Somehow or other I had this spark of Krishna consciousness, and my father detected it. My father used to receive many saintly persons at our home, and to every one of them he used to say, “Kindly bless my son so that he may become a servant of Radharani [Lord Krishna’s eternal consort].” That was his only ambition. He wanted me to be preacher of Bhagavata, Srimad Bhagavatam, and player of mridanga and to become servant of Radharani. Every parent should think like that; otherwise one should not become father and mother. If due to past pious activities one gets a good father and mother, that is a great chance for advancing in Krishna consciousness. I am very much indebted to my father, and I have dedicated my book, Krishna Book, to him.